This first-half statement was never going to be spectacular. Management had previously described June’s annual results as “miserable” while subsequent updates — during September and October — owned up to somewhat mixed trading. In the event, both revenue and gross profit — SYS1’s “main top-line measure” — dropped 5%. Reported profit included start-up expenses of £1.1m relating to the new Ad Ratings service (more on that later) and a £251k windfall from the local council (point 8). The ‘non-underlying’ severance and re-branding costs of last year were not disclosed this time. SYS1’s September and October trading updates had suggested the business was “stabilising” — albeit at a slower rate than had been anticipated. A product re-design and a new “pricing framework” reinvigorated the Innovation division (which tests new marketing concepts), while similar actions are expected to revive the Communications division (which tests adverts before broadcast). Meanwhile, the Brand division (which tracks ongoing brand popularity) suffered “isolated client churn”. All told, it seems SYS1 continues to re-jig its services and lower its prices to combat “cuts in marketing spend by some of [its] largest clients”. However, the message from clients contradicts SYS1’s talk of cutbacks a little. Similar stories have occurred at Nestle and Procter & Gamble. So, marketing budgets as a whole appear not to have been slashed. Instead, clients have saved money by becoming more selective with who they work with — and some clients look to have dropped SYS1. SYS1 hopes a new Ad Ratings service can return the group to growth. 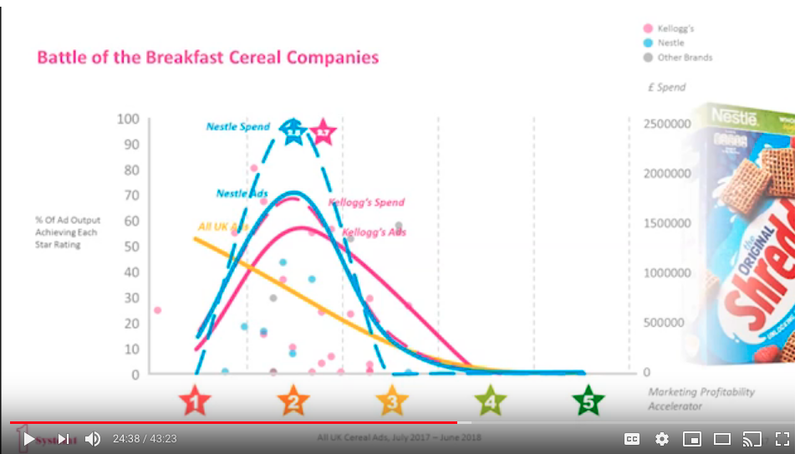 The Ad Ratings website has all the details, but the general concept is for advertisers to be able to monitor the performance of rival brands by using SYS1’s data and analysis. 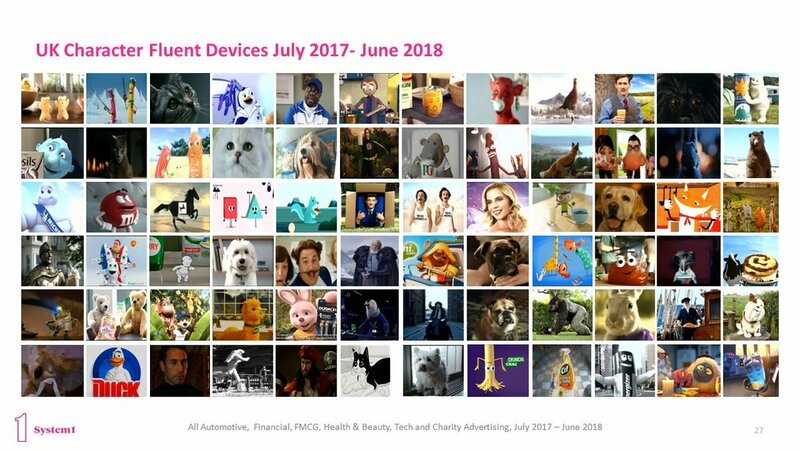 I am sure there is more to the service than what my screenshot shows, but essentially marketing directors will now (in theory) be able to see exactly who in their sector is gaining market share through savvy adverts and clever spending. 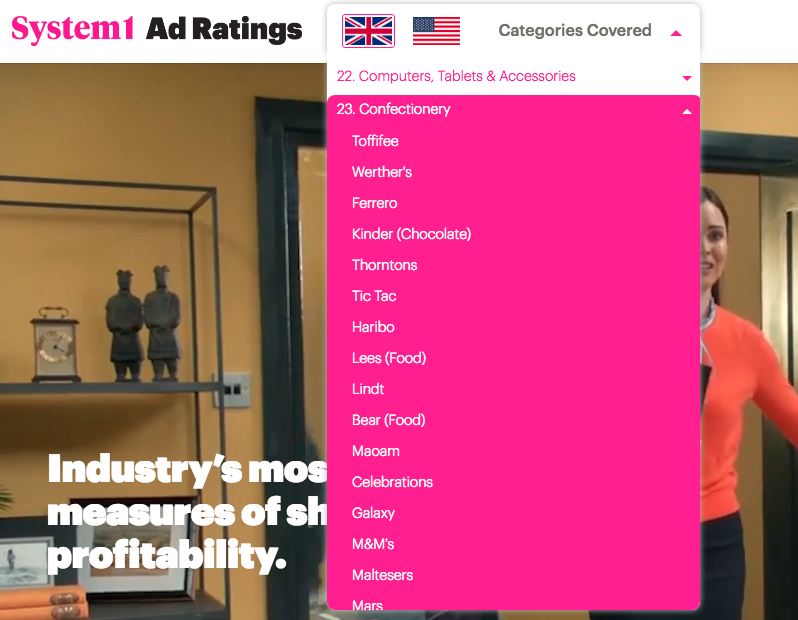 SYS1 has already rated the 27,000-plus different UK and US adverts broadcast during the last 18 months or so, and continues to evaluate every new UK and US advert, too. Ad Ratings is a subscription product, which should generate the firm a more predictable income. The cost per advertising category is £1k or $2k per month, and there are 89 different UK categories and 137 different US categories. These results showed Ad Ratings had absorbed development costs of £1.6m, of which £0.5m was capitalised on the balance sheet. I suspect a similar investment will be required for the second half. So what is the potential for Ad Ratings? Back in July I attended the company’s AGM and SYS1 chief exec John Kearon speculated on one day garnering 2,000 Ad Ratings subscribers. Given the firm served 230 clients during this half year — and that 2,000 subscribers could produce revenue of £20m-plus — I thought at the time Mr Kearon was being rather fanciful. Still, 2,000 was the figure mooted and according to Mr Kearon, subscribers will be attracted to Ad Ratings due to its low pricing. Comparable services, at least according to Mr Kearon, charge 10 times as much. (Although I am not sure whether Mr Kearon gave a strict like-for-like comparison). Ambitions therefore to capture 2,000 subscribers may be a very tall order. Looking though the categories and counting those 4,000 advertisers, two thoughts struck me. First, numerous categories cover only a handful of advertisers. Potential subscribers may therefore already have a good idea of who is performing well in their sector — and not require SYS1’s data. Second, certain categories — such as finance and medical — are hamstrung by various advertising regulations. Such adverts are generally deemed by SYS1 as 1-star money-wasters, which begs the question why anyone would pay to discover how much money everybody else serving the category is (apparently) wasting. Anyway, assuming 5% of the 4,000 or so UK and US advertisers sign up, I reckon Ad Ratings revenue could be £3.3m. Then assume a chunky 30% margin and we could be looking at an extra £1m profit. 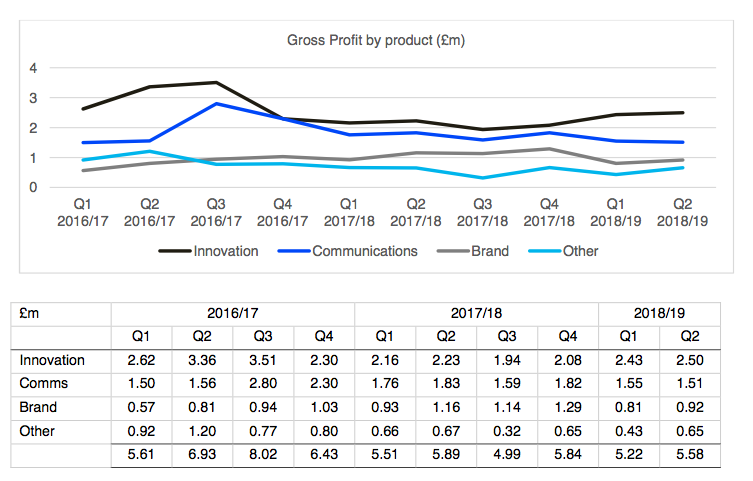 While any extra earnings would be very welcome, the near-term Ad Ratings potential does not appear truly transformational — especially as these interim results showed the main divisions already enjoying a combined £1.9m operating profit. The aforementioned reduction to the headcount ensured SYS1’s margins remain quite respectable. 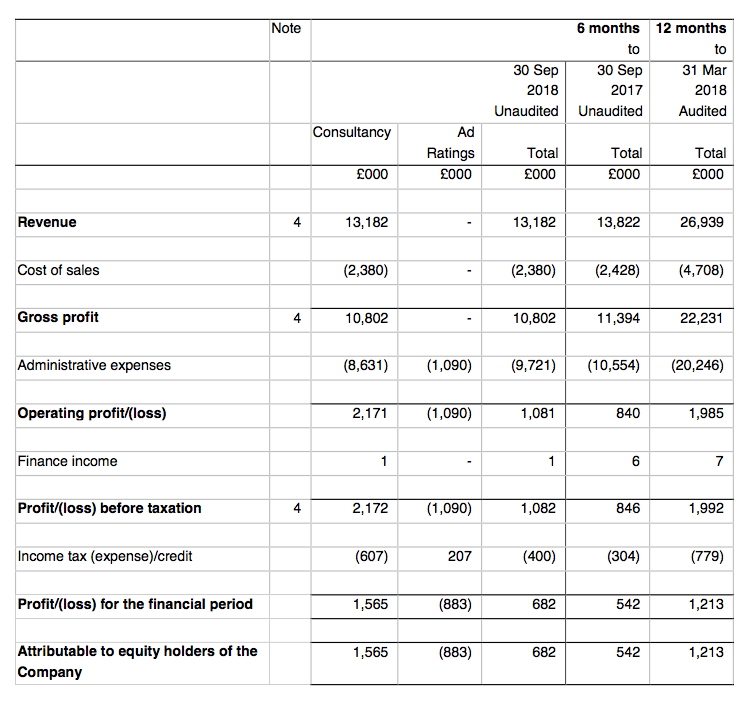 Excluding the Ad Ratings costs and the £251k windfall, operating profit represented 14.5% of revenue and 17.7% of gross profit (SYS1’s “main top-line measure”). 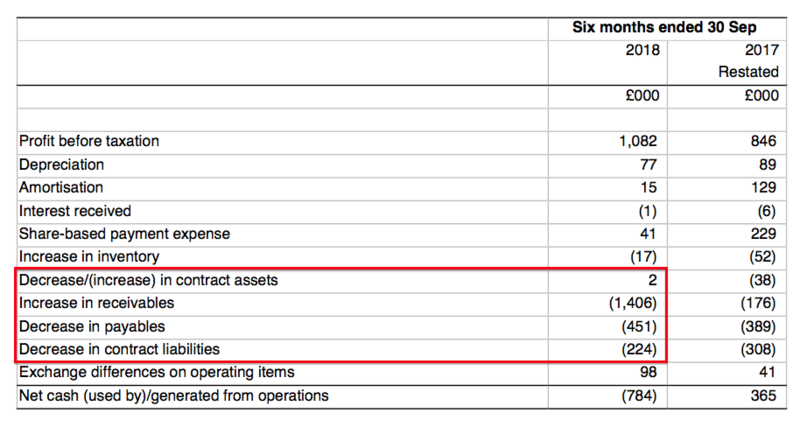 Furthermore, the balance sheet continues to show cash (£3.6m or 28p per share), no debt and no pension complications. However, cash flow was not great. No real explanation was given, save that cash flow was “lower than we would expect” and due “principally to debtor days increasing from 57 days… to 77 days”. SYS1 has never suffered cash flow problems before, so I trust this working-capital performance is a half-year timing issue rather than anything more sinister. I am not sure why this £246k does not match the £498k Ad Ratings expenditure that management said was capitalised on the balance sheet. Anyway, the Ad Ratings investment and wider cash flow performance prompted SYS1 to admit its final dividend “may be reduced”. News of a potential dividend cut is never great, but at least SYS1 claimed the savings could be used to “purchase shares at an attractive valuation”. I have to confess, I do not know what to make of this. I suppose I should be pleased the company wishes to buy back its shares at an attractive valuation. (And some of the senior managers have been buying shares of late anyway). However, SYS1’s previous buyback (during 2016/17) involved spending more than £3m purchasing shares at almost 400p. The price has since dropped close to 50%. I can see why management might think the shares are attractive. Doubling up this first-half’s operating profit of £1.9m (before Ad Ratings costs) gives earnings of 22p per share after applying the 28% tax seen within these results. 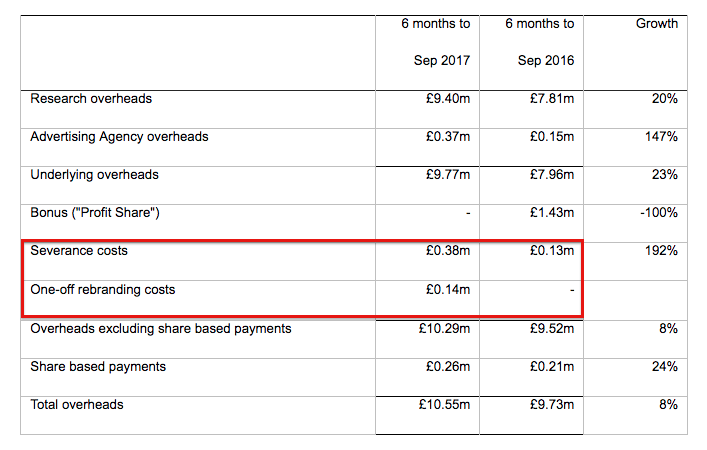 Then subtracting the 28p per share cash position from the 230p share price gives an enterprise value of 202p per share. Dividing that 202p by my 22p per share earnings guess produces a possible P/E of 9. I must admit, the ‘core’ business (i.e. excluding the Ad Ratings start-up) does look cheap — especially if you believe Ad Ratings will eventually generate a profit. However, I have been guilty of excluding certain SYS1’s costs before…only to find they become part and parcel of the ongoing business. In particular, SYS1 started an advertising agency the other year — the losses for which are also separately disclosed from the ‘core’ business. Trouble is, this agency still loses money and is now described as a “valuable showcase” for the firm’s main services. Therefore my valuation sums now include the agency’s losses… and I do wonder whether the Ad Ratings service will also lose money for years… and ultimately become another “valuable showcase”. To be honest, my main dilemma right now is deciding whether SYS1’s services will actually be that useful to many more clients. You see, I have read the book, watched the presentations and I am convinced about SYS1’s “pioneering” System1 approach to marketing. However, existing clients keep on quibbling about price while the firm’s products seem to be re-designed every year. So maybe the people who actually work in advertising — or those who set advertising budgets — have a different experience of using System1 thinking. Maybe the firm’s “pioneering” approach is, well, no longer that pioneering. While I ponder further, the shares yield 3.3% assuming the 7.5p per share dividend is maintained. If Ad Ratings takes off then hopefully that can lead to similar ventures. Doesn’t say whether they are paying subscribers but seems a reasonable start if they are. Thanks for highlighting the Tweet. I have asked SYS1 and sadly the 50 include free trials. The free trial lasts 14 days and so after one month and an even distribution of sign-ups, the max we can expect to be paying could be 25. Assume a (very bold) 50% conversion rate and we get 12-13. Which does not feel great. Great bit of analysis. Thanks.